Habitat : Cultivated in south east asia. 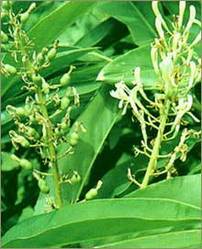 Uses : Alpinia Galanga rhizome is used against rheumatism, bronchial catarrh, bad breath and ulcers whooping colds in children, throat infections, to control incontinence and fever. Alpinia species show promise as anti-fungals, hypotensives, enhancers of sperm count and motility. Anti-tumor and anti-dementia effects have been observed in rodents. Alpinia Galanga is a stimulating aromatic and has been successfully employed to aid the digestive process, preventing fermentation and removing flatus. It is useful in case of dyspepsia, preventing vomiting or sickness of the stomach and facilitating digestion. It may be used in all cases in which a stimulating aromatic is indicated. It tones up the tissues and is sometimes prescribed in fever. Homoeopaths use it as a stimulant. It has some reputation as a remedy for perineal relaxation with hemorrhoids and for a lax and pendulous abdomen. It is used as a snuff to treat cold and flu symptoms. Galangal Root has also been used as a digestive aid, especially in combating dyspepsia and flatulence. It is also seen as a remedy for seasickness and motion sickness. It is used against nausea, flatulence, dyspepsia, rheumatism, catarrh and enteritis. It also possesses tonic and antibacterial qualities and is used for these properties in veterinary and homeopathic medicine. This herb has a constricting or binding effect, for example: one that checks hemorrhages or secretions by coagulation of proteins on a soft surface. It also restores, nourishes, and supports the entire body; it exerts a gently strengthening effect on the body.